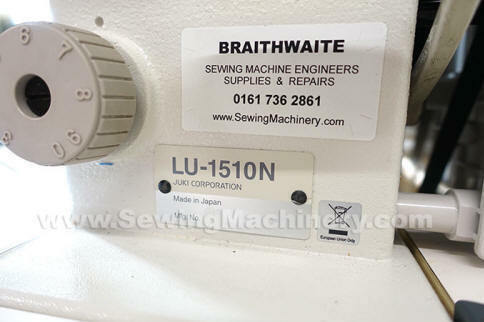 Juki LU-1510N single needle industrial sewing machine with bottom feed, needle feed and walking foot top feed. As an upgrade from the LU-1508N/LU-1509N manual lubrication variants; The Juki LU-1510N model features an automatic lubrication system and additional bottom feed adjusting mechanism. The automatic lubricating mechanism helps to improve reliability and can lower maintenance costs. The machine is provided with a sub oil pan and double filter to keep dust from entering the oil system. The machine is equipped with a bottom feed adjusting mechanism that adjusts the amount of bottom-feed while keeping the needle feed fixed. With this adjusting mechanism, the machine can prevent uneven material feed without changing stitch pitches. The stitch length can be easily adjusted up-to 9mm by the stitch dial. 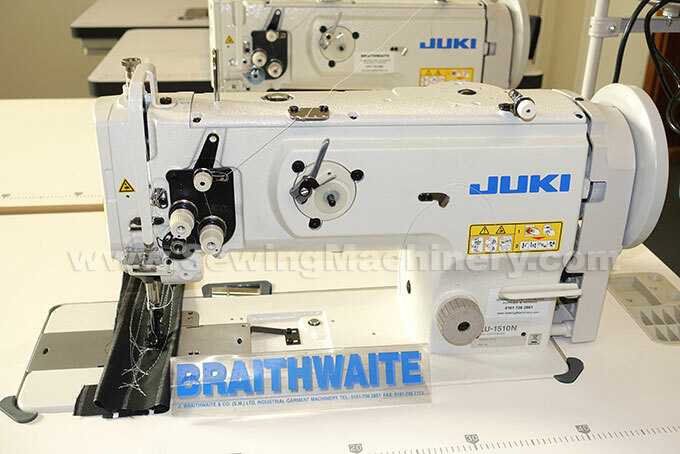 The machine is provided with many improved features that offer enhanced operability such as an easy-to-observe area around the needle and fitting of the bobbin winder on the front face of the machine arm. The knee-lifter mechanism is built in the bed. This reduces the pressure required to operate the manual knee-lifter. The machine is equipped as standard with a safety clutch for preventing hook breakage, which is resettable by pressing a button. Well tensioned seams are consistently produced without pitch errors. Maximum stitch length of up-to 9 mm, easily selected via the stitch dial.